Bluehost is one of the most popular web hosting providers officially recommended by WordPress on their hosting requirements page. 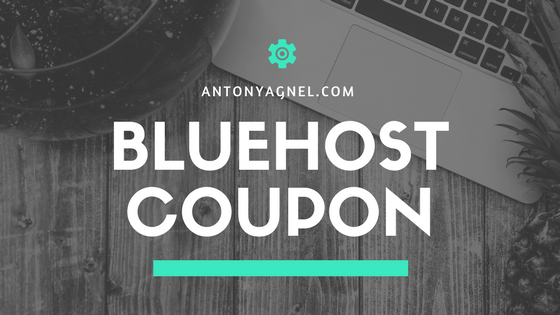 Before I share this special Bluehost coupon with you, I would like to provide you with details about their plans and packages. If you are too busy and you are like ‘no, just give me my discount’, you can claim the Bluehost discount right away by clicking on the button below. Bluehost Basic – Lets you host one website. Bluehost Plus – Lets you host unlimited websites with Spam Experts and $200 worth marketing offers for FREE. Bluehost Choice Plus – Lets you host unlimited websites with Spam Experts, Domain Privacy, Site Backup Pro and $200 worth marketing offers for FREE (Recommended). After choosing the desired plan, I would recommend you to purchase hosting for a term of two or three years so that you can save some money. Higher the term plan you choose, cheaper the cost will be. Since Bluehost offers cPanel hosting, you can create professional email addresses for free. All hosting plans come with a free CDN (Content Delivery Network) for your site provided by Cloudflare. This can boost your site’s speed by up to three times the normal. Since you will be getting $200 worth of marketing credits for free, you can promote your site on Google AdSense, Bing Ads and Facebook for free. Bluehost also offers 1-click installation of WordPress – you can check out this guide for installing WordPress on your Bluehost account. Once your site starts getting a good amount of traffic from search engines such as Google, Bing, Yandex, and DuckDuckGo you can upgrade to a VPS, Dedicated or Managed WordPress hosting depending on your site’s requirements. By claiming this Bluehost web hosting coupon, you will be able to get the maximum discount on your first billing cycle at $2.95 per month for three years. If you really found this coupon useful, please share it with your friends and followers on any social media network. Come on, I just helped you to save more than 40% of the total cost you need to spend on web hosting for one year. NOTE: You can save money only on your first billing cycle as there are no discounts for renewals. Thus you can make the most out of it by claiming this deal right away. Payments can be made via PayPal and credit cards. Hi, this is Sri, recently one of my friends started a small online business so I advised him to take a domain name and hosting services from Bluehost. He applied your Bluehost coupon and got a 33% discount and a free SSL Certificate. Hello Srikanth, I’m glad to hear that. Thanks for sharing your experience with us!